Medical billing is a procedure of payment practice in various ways for health systems. The process includes submission and follow-up of claims with the health insurance companies to claim the services offered by the healthcare providers. In simple terms, we can define a Medical billing is a process of converting a healthcare service to a billing claim to benefit the individual with the reimbursement. Tech Tammina has a proven competitive efficiency to manage your medical billing services. We have a team of medical billing specialists who have years of experience accompanied by many insurance payers. The medical billing process is determined to be the design of reward for being unhealthy. In fact, this reward helps an individual in different aspects of problems related to healthcare. One can be confident and brave enough to fight the diseases, surgeries, treatments, etc., to get rid of paying, investing and spending a lot on hospitals. And this process majorly benefits the healthcare providers such as doctors, nurses, orthopedists or any specialized doctors to follow up on regular claims with insurance companies to receive the payment for their rendered services like treatments and investigations. Tech Tammina eases this entire procedure in order to satisfy and claim the promises offered by insurance companies. Our perspective is to optimize your overall revenue cycle by ensuring your medical practice is efficiently running with profitability. We came up here to minimize your time on the claiming tasks which are consuming more time and also reducing your administrative burden. Our key goal is to reach your bottom line with a relevant success rate as expected. Tech Tammina concentrates on your entire billing process by implementing our advanced reporting tools and business analytics and ensuring to provide a transparency control on the claiming procedure. The medical billing is also considered to be as co-paying because sometimes the insurance company will pay completely, but in few cases you have it pay part of it. These cases may be in rare situations which lead to a loss of income for the hospitals and it also denies the healthcare of the patient. We serve as the predominant medical billing service provider for healthcare institutions to boost up the revenue targets as specified accordingly by the healthcare providers. The communication between a health care provider and the insurance company is included in the billing process. Tech Tammina implements one of the top medical billing services to accomplish your claims easier and faster. Generally, medical billing seems to be complicated, but here we brief in eight simple steps. The steps include: Claim Transmission, retrieval of medical claims, Medical coding, charge entry, Auditing, Medical report transmission, preparing & submission of claims, Account receivable follow up & arranging collections. The process of submitting a bill or claim to a health insurance company or payer by a health care provider via electronic means is electronic billing process. The medical billing reports are transformed through electronic methods for ease of time and process workflow. Our respective medical billing service expert processes the validated bills and reports to the considered insurance companies to generate the payment. We convert the reports received by hospitals into the revenue by going through necessary steps and sending reports to the concerned insurance providers electronically. This is an easy, simple and faster billing method which is automated electronically. 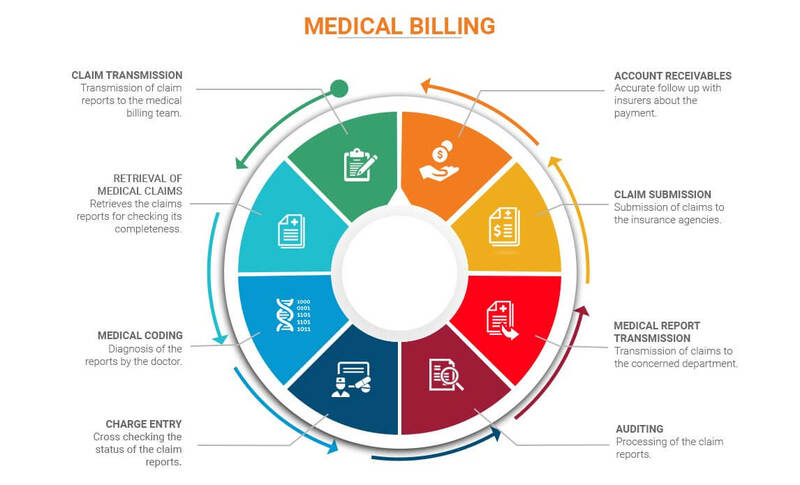 Electronic Billing Service can be made ease by Tech Tammina’s Medical Billing Professionals with expertise in entire Electronic Billing Service and management. One of the optimal and final steps in a medical billing cycle is paid service. Tech Tammina ensures ineffective payment posting in the medical billing processes. To get the clear amount of insurance claims, the health care provider should have a thorough knowledge of different insurance plans and insurance companies. This is a major drawback why healthcare providers seek the support of medical billers. Tech Tammina has a proven knowledge in rendering medical billing services approximately according to the various insurance plans, rules and regulations as per the law. We process the claims according to the insurance plan applicable to patient insurance. We ensure to make it completed such that everyone should be satisfiable by the end results and revenue. Additionally, we are implementing new techniques to integrate patients and healthcare providers into the billing procedures in a straight forward manner. When it comes to payment, it totally varies sometimes between the healthcare provider and insurance company. The insurance company cannot reimburse full amount which the healthcare provider listed, as a process of validation and compliance they deduct the amount rate. In such cases, we the medical billers validate before the insurance company and process accordingly in a genuine way. We guarantee the payment if the reports are valid. The digital version of a patient’s medical history which is estimated instead of paper chart is an electronic medical record (EMR). The electronic medical record holds the data of standard medical and clinical record. Worried about paper records, either they are gathered in one place or have to keep on searching for missed papers or files? Then the Electronic medical record is the best idea to collect and store the data in one place. So it helps in tracking the data or history at any time, also helps in identifications of patient records, visits, and screenings. EMR assists in monitoring the treatments, and other parameters. EMR enhances the quality of billing procedure by minimizing the work effort. Tech Tammina is following this Electronic Medical Record process to deliver the work collectively and consistently. Tech Tammina had a proven support for medical billing through our responsive customer care services. We have a team of experts who enrich the hope of building your medical billing services effectively within no time. Our services range 24/7 round the clock so, whenever you have a query on your billing structure and whenever you have an issue with medical billing then within fractions of seconds your issue will get a solution. Tech Tammina is therefore called as a responsive organization due to our support for the clients. We believe in there will be any solution to every query. Our clients ring us with a problem but in the end, they cheer with a resolution. So if you are trying for a service which has to reduce your medical billing cost, then pick your phone and dial to us. We will guide you the way to reach the best-solving services.